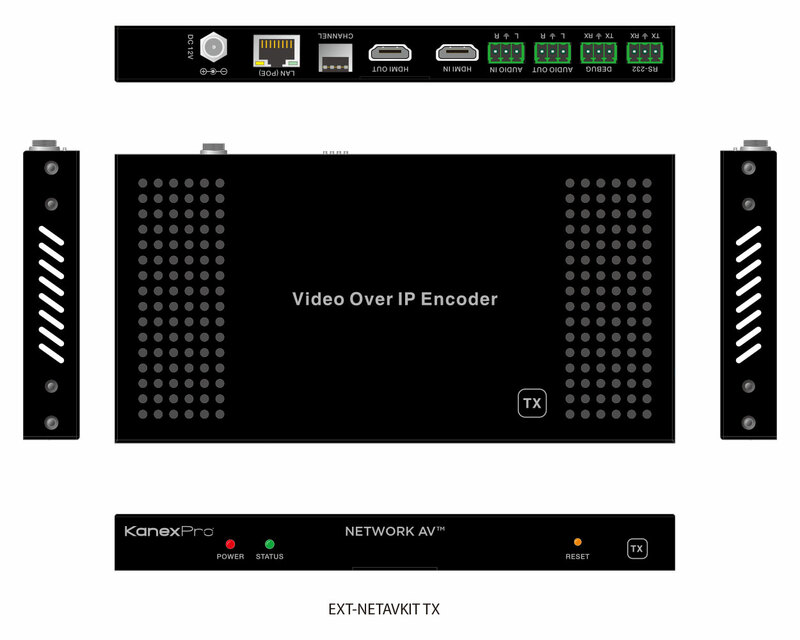 The KanexPro EXT-NETAVTX is an AV over IP encoder/ sender with one HDMI input , one local HDMI output, phoenix connectors for audio in and out and a LAN (Ethernet) port with RS-232 control port. The encoders uses advanced H.264 compression algorithm to transmit full HD 1080p/60 from HDMI based devices with lossless video and audio with latency up to 1.5 milliseconds. 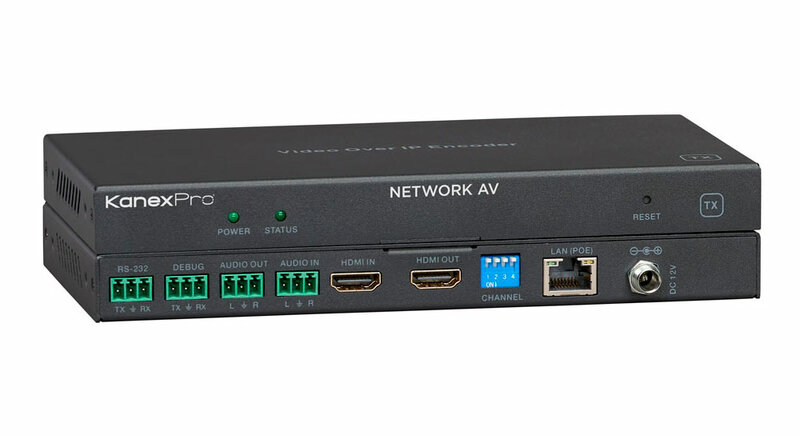 It supports POE (power over Ethernet) when connected with a POE network switch with distances over a single CATx up to 330 ft. (100m) delivering one to one, one to many and many to many over the Ethernet switch. Compliant with HDCP, this encoder can be combined with our decoder – EXT-NETAVRX offering a complete configurable high quality, low-bandwidth H.264 video supporting resolutions up to 1920x1080@60fps. It’s a great solution for those looking to upgrade the traditional DVI/HDMI matrix switchers. 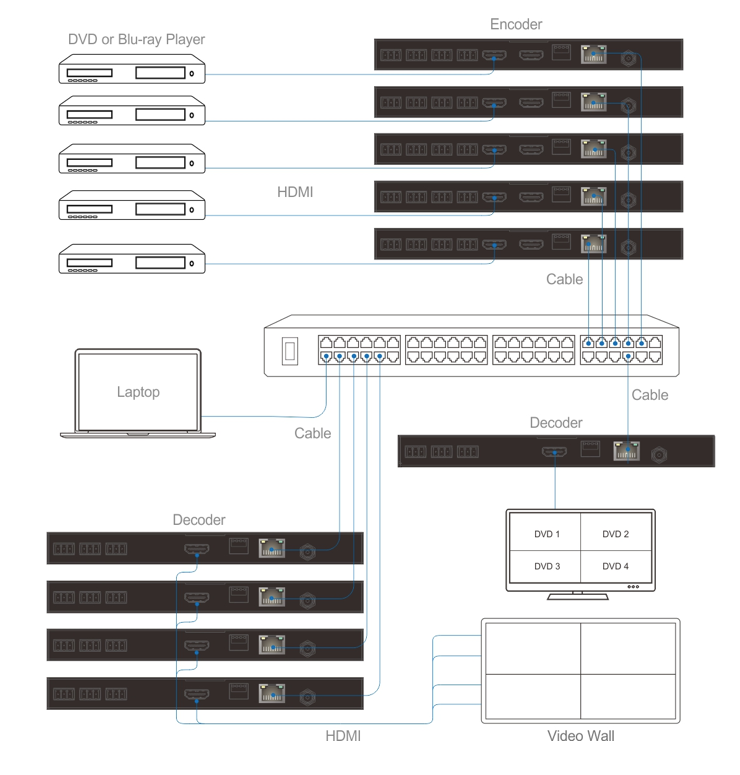 Create a 3x3 video wall or multi-view by adding multiple decoders to your application. They instantly display and have lossless video for critical video applications. They can all be controlled by a central web based GUI. One to many, or many to many, the EXT-NETAVTX offers one central control over web GUI to manage all your sources and displays. The controller is built-in to the Encoder ( transmitter) which will manage all your HDMI sources and display devices using Web GUI, mobile app or any third-party control system. Ideally used for digital signage in bars, restaurants, house of worship centers, large university campuses and in corporate AV signage where sending high resolution video and audio is critical.